Across the nation, people are struggling with weight and health issues. Two thirds of adults are overweight, and the number suffering from chronic illnesses such as diabetes, heart disease, and cancer is climbing. Many also just walk around with brain fog and low energy. Yet people continue the same lifestyle patterns that they know are diminishing the quality and even the length of their lives. What is standing in the way of their making better, healthier choices? A health coach teaches you about healthy eating and digestion, exercise, and stress-reduction, as well as how to overcome cravings, improve your sleep, and maximize your energy. There is no fixation on calories, fat, protein, carbs, etc. nor lists of restrictions of good and bad foods or exercises. Rather, your coach offers concrete guidance and inspiration to help you shift your behavior to healthier habits by making gradual, step-by-step changes to your diet and lifestyle. Health coaching took on real momentum in the 1990s, when it was unexpectedly found to be the most effective and timely approach to treating alcohol addiction. Today, health and fitness coaching is the largest category of coaching in this country, as people take more responsibility for their wellness and seek to prevent, rather than treat, disease. Health coaches fill in the gaps left by our current medical model, which focuses on surgery and drugs instead of preventing the pathologies that necessitate them. Coaching is effective because we are social creatures, and we grow, change, and heal through our interactions with others. A health coach does not tell you what your goals should be, but rather helps you identify them. Coaches guide you past emotional obstacles and rationalization, then offer simple recommendations and ongoing follow-up and feedback that prevent lapse and result in lasting lifestyle improvements. Education and prevention today help you avoid doctors, drugs, and surgery tomorrow. My approach to coaching is unique for two reasons. First, it is informed by my decades of work in philosophy. Admittedly, this may sound a bit odd at first, but I draw inspiration and ideas from millennia of western philosophical wisdom about leading a meaningful and happy life. My coaching practice is particularly inspired by Socrates’ view that any successful life is based upon two pillars: “know thyself” and “nothing in excess.” If you were to implement only two wellness concepts over the course of your entire life, I am convinced these two would make you happiest. Second, my approach is “holistic” in the best sense of the term. Self-care is a basic principle of all living things, and when we fail to nurture ourselves, something deeper is going on than just a failure to, say, eat less junk. As your coach, I will help you determine not just where you want to go, but also why you’ve failed to get there until now. Do these questions sound familiar? These are the kinds of things we address together. 6. Would going gluten- or dairy-free make me feel better? 9. How do I stick to an exercise regimen when I feel tired much of the time? 10. How do I fully implement the health advice from my doctor or nutritionist? 11. How do I read labels at the grocery store? 12. How do I get my kids off junk food and sugar? 13. How can I avoid gaining weight when I dine out and travel? 14. How can I create a healthier lifestyle without suffering and radical dieting? 16. What effect does stress in my relationships have on my health? 17. What effect does stress at work have on my eating patterns? We begin with a complimentary health history that helps you clearly formulate your health and wellness goals. Then, over the course of six months, we work together to help you realize those goals. Six months have been shown to be the time needed to create lasting new habits. As noted earlier, our biweekly meetings combine education and motivation. We talk about what you want to achieve, I give you tools and information towards that end, and we set 3–4 small goals for you to work on over the next two weeks. I hold you accountable—without judgment—for sticking to your commitments. Because these goals are small and manageable and the process is gradual, there is no suffering and deprivation. We “crowd out” unhealthy foods and behaviors with their healthier versions. Over the course of the six months, small changes add up to a new lifestyle. It’s gradual, and, unlike crash diets and New Year’s resolutions, it works. Here is a simple graphic outlining the process. 1. Relationship: We talk at length so I can understand your background and concerns, and we can connect. 2. Aspiration: We explore and define your overarching weight, energy, and health objectives. 3. Assessment: We take stock of your strengths and the obstacles you face that have blocked your success in the past. 4. Goal Setting: Once we understand what you really want and why you are failing to get it, I help you identify concrete goals to create a happy, healthy life that is flexible, fun, and rewarding. 5. 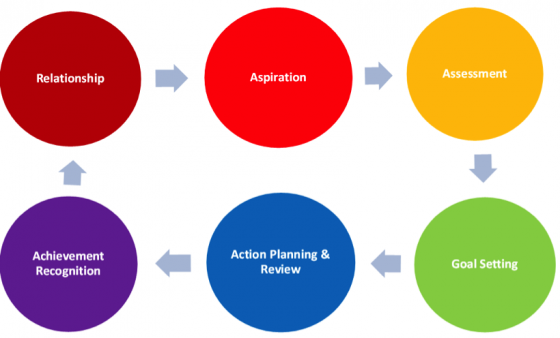 Action Planning & Review: At each meeting, I give you 3–4 small Action Steps to work on for the next two weeks that will start you down the path of transforming your behavior and lifestyle and thus of attaining your goals. 6. Achievement Recognition: At each subsequent meeting, we review what has worked and what has not, discuss why, and set 3–4 additional Action Steps for you to incorporate to move yourself even further along the path to better health. If you were unsuccessful with the previous session’s tasks, I hold you accountable, and we try to get the bottom of what the problem was and how to overcome it. At the end of six months, you will have received the knowledge, tools, structure, and support to bring you to a place you had never been able to get to on your own. This system has been the key to my clients’ lasting success. There is a reason why people gain back all their weight after going off the latest fad diet: There has been no education and no lifestyle changes to stop them from reverting to the bad habits that made them heavy and sick in the first place. If you want to achieve your weight and health goals once and for all, and finally get off the diet roller coaster, health coaching provides the method and answers you seek. Just to clarify, health coaching is not intended to take the place of medical care. The idea is to consult with a health coach now to start implementing good habits that allow you to avoid illness, drugs, and doctors later. And if your issues are outside the scope of my practice, I will let you know that, too. I primarily work with women concerned about achieving their desired weight, health, and energy levels. I guide and support them in defining their weight and wellness goals, and in developing lasting lifestyle changes. Since most of my clients are mothers, this includes strategies for feeding and raising strong children, and for promoting a more peaceful, healthy home environment. I also run a Teen Coaching Program, in which I help educate teenagers about their health and nutrition needs, teach them how to read labels and shop, and make them understand the connection between diet and exercise, on the one hand, and the health of their brains and bodies, on the other. In addition, we work on techniques that help them avoid the dreaded “Freshman Fifteen” when heading off to college. My goal is to get them into a healthy rhythm that will set them up for a lifetime of proper self-care. They take to the message well because I am neither their parent nor schoolteacher, but, rather, the coach who cheers them on.